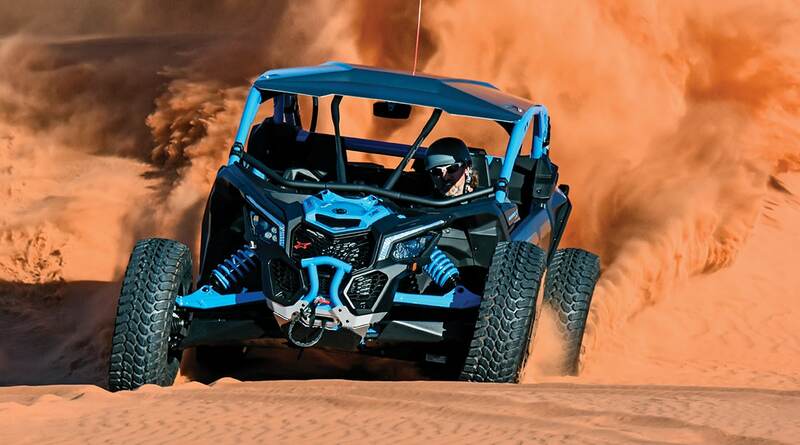 Can-Am is on a roll with the Maverick X3 and Maverick Trail, and 2018 brings six new X3 Turbo models and the new X3 900 HO. Rock crawlers and trail riders get four new special editions, including the new 72-inch, 172-horsepower Maverick X3 X rc Turbo R and 64-inch, 120-horsepower X3 X rc Turbo. We got a chance to test the X3 X rc Turbo R at the SxS Adventure Rally at Utah’s Sand Hollow State Park. Not only does Sand Hollow have some great rock trails, it also boasts dunes and desert. Let’s put the X3 X rc Turbo R through its paces. 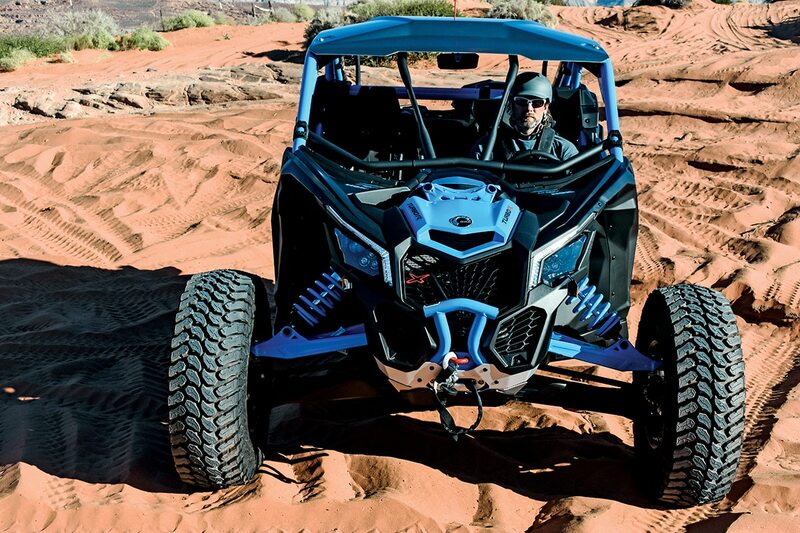 Can-Am unleashes its first Rock Crawler UTVs, the 172-horsepower Maverick X3 X rc Turbo R and 120-horsepower X3 X rc Turbo, both with special Smart-Lok electronic-locking front diff and connected EPS steering assist, plus a plethora of Special Edition hardware. More horsepower is news, jumping from 154 horsepower in 2017 to 172 horsepower for 2018. 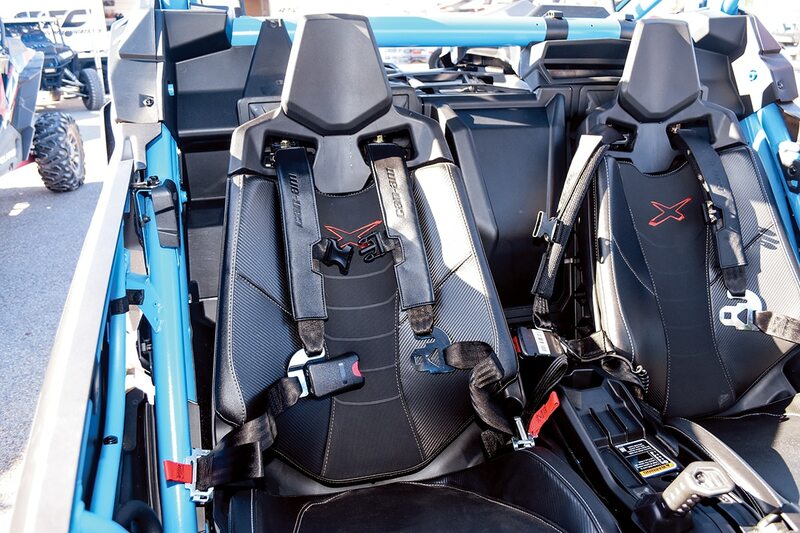 The base model Maverick X3 Turbo makes 120 horsepower without an intercooler. BRP introduces the rock-crawler version of the Maverick X3 X rs Turbo R and Turbo, creating the 72-inch-wide Maverick X3 X rc Turbo R and 64-inch X3 X rc Turbo. A new Smart-Lok front diff with front differential module monitors six parameters—front-wheel speed, steering angle, throttle position, gear selection, engine torque and vehicle speed—to automatically select the amount of diff-lock to apply. This allows easy steering while maintaining maximum traction. Smart-Lok has new toggles on the dash, next to the DPS-assist switch, to select from four modes—2×4, 4×4 fully locked, 4×4 Trail Active (rock) and 4×4 Trail—for more versatility and feel to match specific terrain, conditions and demands. The 4500-pound winch gets aluminum and UHMW skid plates, and both Rock Crawler Turbos get front and rear tow hooks. 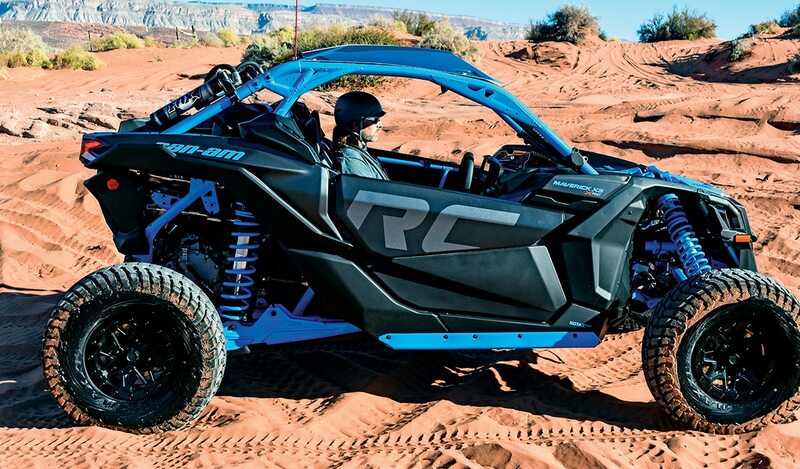 The X rc Turbo R weighs 120 pounds more than the rc Turbo. 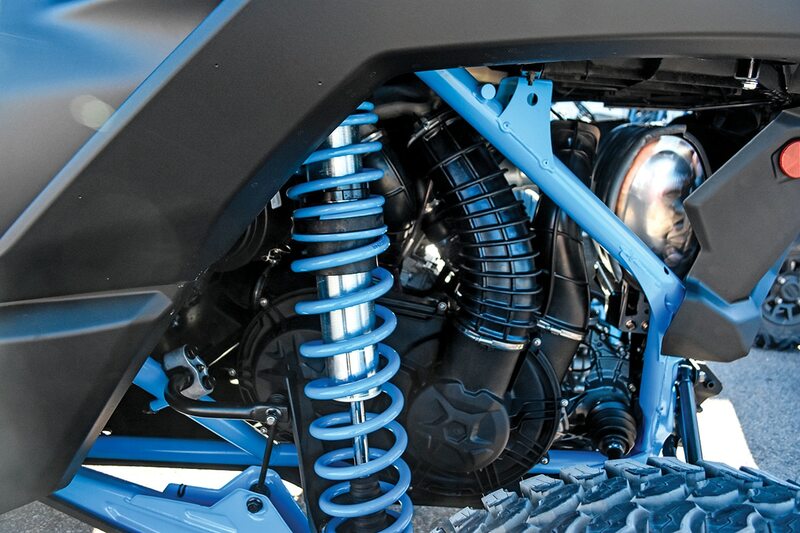 To complement the Smart-Lok front end, the X3 x RC Turbo Rs get EBS and Hill Descent Control, UHMW rock sliders, suspension arm protection and front diff guards, rock-specific 30-inch Maxxis Liberty tires on 14-inch beadlock wheels, a 4500-pound winch and Octane Blue frame, cage and suspension components. The X3 X rc also gets the X rs Fox Podium 2.5 front and 3.0 rear RC2 Internal ByPass (IBP) shocks with dual-rate springs and adjustable cross-overs, dual-speed compression, rebound and preload. The base X3 X rs Turbo doesn’t get the Turbo R’s intercooler, high-end shocks with remote rear reservoirs, roof, bead-lock wheels, 72-inch width or boxed suspension arms. Instead, it gets Fox Podium RC2 2.5 front and 3.0 rear QS3 piggyback shocks, 20 inches of travel and faux beadlock wheels. The 2018 Maverick X3 X rc Turbo R is $28,999. Maverick X3 X rc Turbos are $23,999, while X3 X rs Turbo Rs are $26,899-27,099 and the X3 X rs Turbo R Smart-Lok is $27,499. Polaris’ 2018 RZR XP Turbo is $19,999. The Fox Edition is $22,999, and the Dynamix Edition with Ride Command is $25,999. The 900cc BRP triple has three 74mm pistons, a low 9.1:1 compression and stroke is 67.9mm. A 46mm EFI throttle body and Advanced Combustion Efficiency heads get forced-air induction via a Rotax turbocharger and a Donaldson airbox. It’s top-shelf. Like we said, the CVT clutch isn’t as touchy as a Polaris, so it’s very easy to modulate in delicate situations, and CVT belts last longer. The gated shifter is fairly slick, and the shifter pattern is P-R-N-H-L. The Smart-Lok system makes driving the X rc a breeze, as it steers lightly when asked yet maintains serious traction in Trail Active and Trail modes. Steering is almost as light as when in 2×4 mode. This is the best Maverick diff we’ve experienced, and it’s matched well with the Quick-Response System X transmission. HOW DOES THE X RC TURBO R HANDLE? Beautifully. 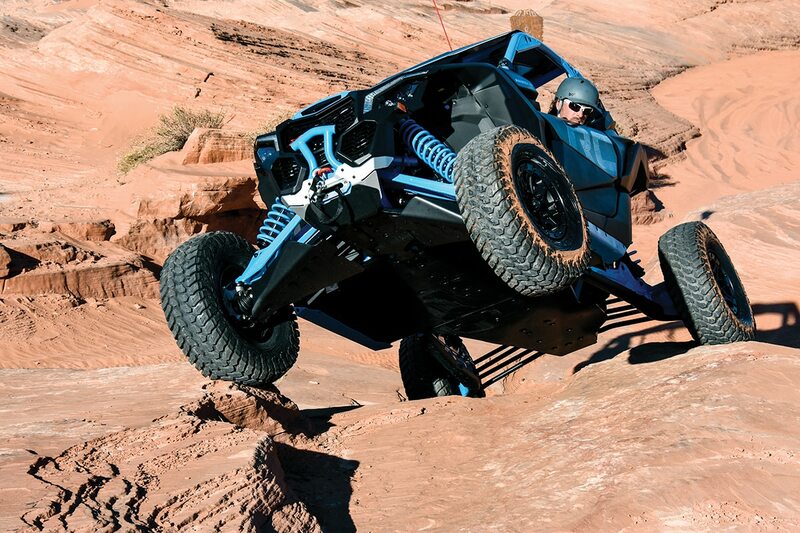 While it isn’t as agile as a RZR Turbo on tight trails, it’s much more stable at higher speeds. The high-end shocks, dual torsion bars, low center of gravity and the Smart-Lok brain unit work well together to provide precise handling with rally-car turning and traction. It’s also confidence-inspiring in the rocks and tight stuff. 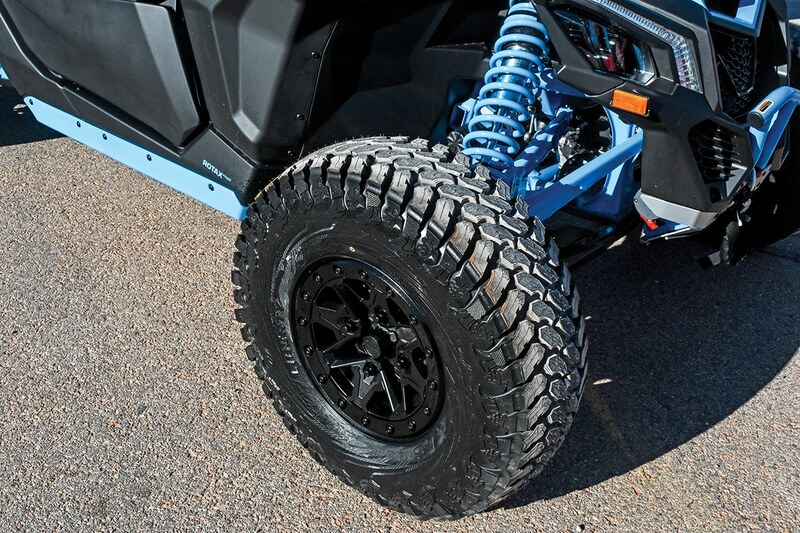 The Can-Am has two-piston calipers squeezing 262mm rotors and two separate braking systems, and blacked-out aluminum beadlock wheels grip the grippy Maxxis Liberty 30×10-14 rock tires. The X rc even has rock sliders and full UHMW skid plate. HOW IS THE HIGH-END SUSPENSION? It’s the best we’ve driven, production-wise. 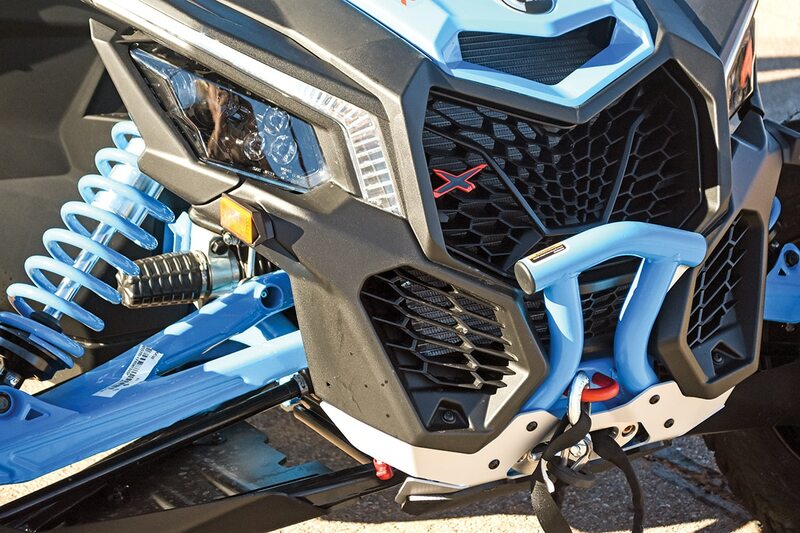 While the Polaris Dynamix Edition Turbo and Yamaha YXZ1000R Special Edition’s Fox X2 suspension are more adjustable, the X3’s ride quality is awesome, and it has the most travel in its class. Boxed front arms and the Fox Podium 2.5 RC2 front shocks deliver 22 inches of high-quality travel, while the log trailing arm and Fox Podium 3.0 remote-reservoir IBP shocks deliver 24 inches of Trophy Truck-like travel. There is still room for improvement, though, as the Shock Therapy X3 X rs and Max X rs IRS, IBP and spring-kit mods improve ride quality even more. Strong enough for rock crawling and most conditions. 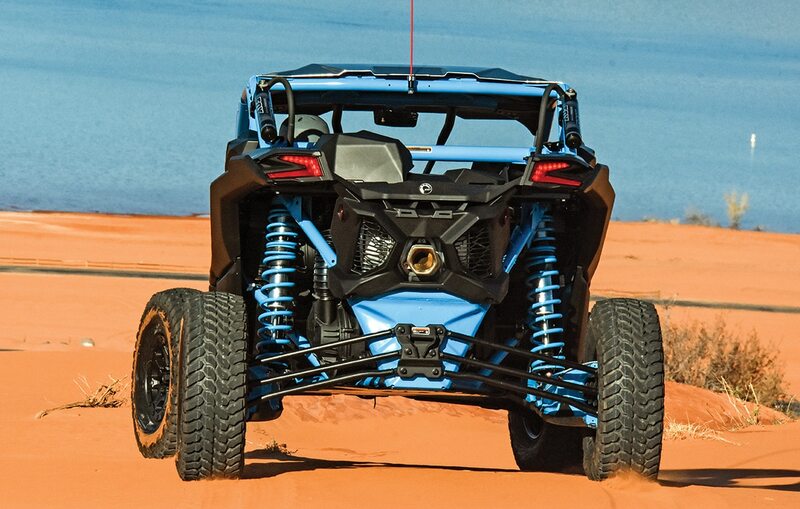 Can-Am is the only manufacturer to offer separate front and rear hydraulic braking systems on a sport UTV, and it uses two-piston calipers on all four corners with 262mm front and 248mm rear rotors. We have driven several X3s, and about half have felt mushy at the brake pedal. Front travel is 24 inches on the X3 Xrc Turbo R, and UHMW skid plates protect the 4500-pound winch and boxed lower A-arms. Only the X rc Turbo R gets the front intrusion bar and hard roof, but both get the Maxxis Liberty 30×10-14 hard-terrain tires, beadlock rims and dual torsion bars. HOW IS IT IN DESERT AND DUNES? Awesome. With excellent handling, stability and suspension, the Maverick X3 X rc Turbo R soaks up nasty terrain at insane speeds and rails dune bowls with confidence. It feels planted at speed, yet the suspension makes it ride like a magic carpet. It flies well, too, but we have to hit jumps faster because the suspension soaks up the launch. HOW IS IT IN MUD AND ROCKS? We didn’t get to drive it in mud, but our 2017 X3 X ds didn’t like getting the Ergo-Lok seat rails muddy. They froze up, as the minimalist fenders and quarter doors let roost into the cab. Prowess in rocks is unbelievable, as the Smart-Lok front diff fine-tunes steering assist and traction automatically. 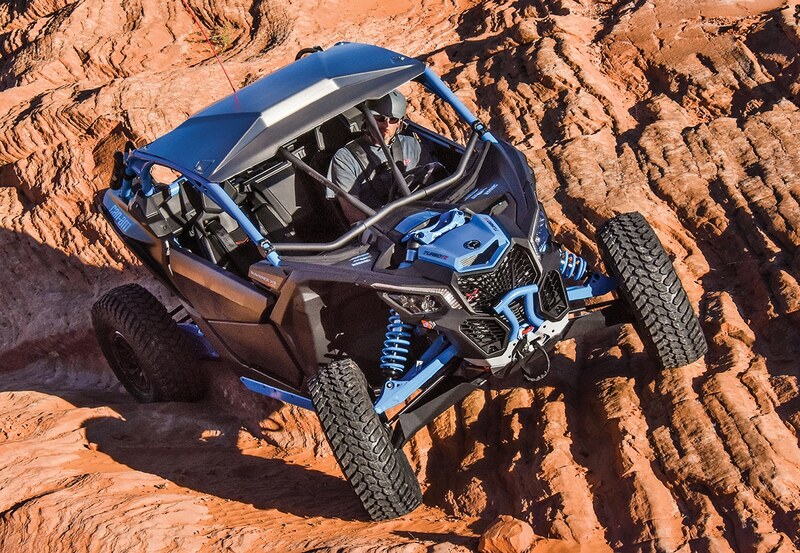 Between rocks, desert and dunes, this UTV will be hard to beat at the King of the Hammers UTV race. The X3 X rc Turbo R gets the same remote-reservoir rear shocks as the X rs. The Fox 3.0 Podium RC2 IBP shocks have dual-speed compression adjusters, plus rebound and cross-over tuning capabilities. The X rs doesn’t get the Octane Blue treatment or the X rc arched lower TTX radius rods for clearance. Rear travel is 24 inches. It’s almost perfect. The Ergo-Lok seats are comfortable, and the low seating position is highly adjustable. The tilting D-shaped steering wheel is awesome, and the instrument panel tilts with the D-wheel. We also like the 1.5-turn steering rack, adjustable EPS, and Smart-Lok system for turning in slow, tight situations. We also like the large glove box and ample leg- and shoulder-room in the futuristic cabin. We don’t like the passenger hold points nor the fabric latch handles, and we hit our knees on the dash protrusions for the door latches. Although armed for rocks, the Maverick X3 X rc Turbo R rocks in dunes and desert, making it the ultimate starting point for King of the Hammers, SCORE and Best in the Desert racing. Can-Am scores a bullseye with the 2018 Maverick X3 X rc Turbo R from 1000 yards. It does everything well and sounds great doing it. Handling, suspension, power and delivery are best in class, and the new Smart-Lok front diff and steering system make it a blast to drive. It does everything well or excellent and only has a couple of rough edges in the next-generation Ergo-Lok cabin. Even the tires are great. If you’re not into rock crawling, this is still an awesome adventure UTV. If you’d rather have the X3 X rs, trust us, get the Smart-Lok Edition ($27,499). Rear Rack capacity 200 lb.